Knock Codes, sometimes called Tap Code come up intermittently in our Cosykiller boxes. 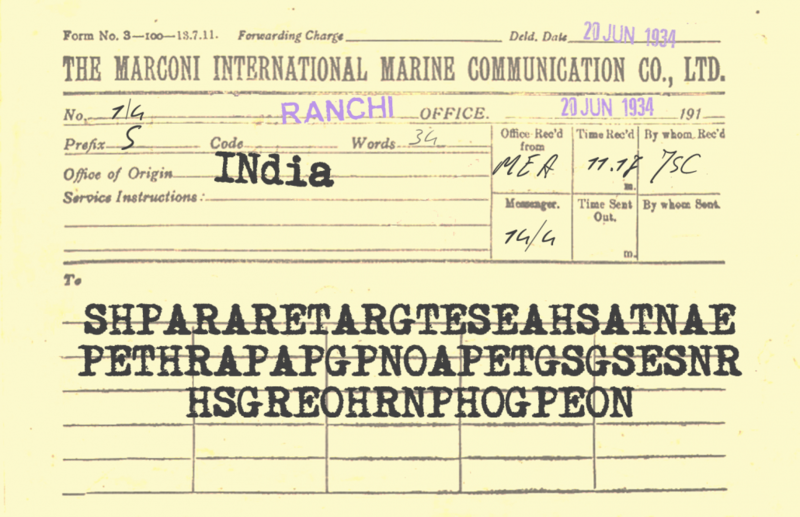 The example below is a telegram written with a classic Knock Code cipher. (We used this on a cruise we did in 2018). Knock Code ciphers encode messages using just 10 letters rather than the usual 26, which makes them quite easy to spot. If you find a message using just 10 letters, then the chances are it’s a knock code cipher created using a Polybius Square. Polybius Square sounds super impressive, but in actuality it’s just a 5 x 5 square with the letters of the alphabet placed within it. Some cryptographers use C/K in the same square, others use I/J in the same square. It depends on the encoder as to their preference, whether it be phonetic, or visual. The above shows a typical Polybius square. It’s created by the five letter words Mango and Fruit. To code your message, you would replace the letter you want within the grid, with the pair of letters on the XY axis. e.g. If you wanted to encode the letter A, your code would be MF, if you wanted to encode the letter S your letter pair would be GU. Decoding would be the same process in reverse. 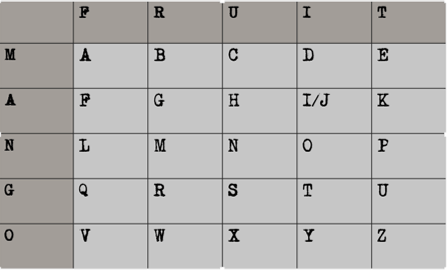 It IS possible to decode Knock Codes without creating the square, though you’ll often find our 5 letter code words show up in other ways within the boxes to give you the code words. Unfortunately this still won’t necessarily help you decode the messages until you know how the alphabet has been placed within the grid itself. (And that’s something we don’t tell you – I know… we’re meanies). Once you recognise the code however, all you need to do is solve it in the same way as a letter substitution code. If the lettering confuses you, type it all into a word document and then use “find and replace” option and replace the two letter combinations with a symbol. Letter substitution codes are hard if there are no gaps between words. However we often use the knock code in telegrams as this gives you a hint on how to solve them. In telegrams a full stop is transmitted using the word STOP which means if you find an 8 letter repeating section, the chances are the letters will be STOP. This gives you 4 letters immediately. After than you’re back to the usual method to decode substitution ciphers by looking at letter frequency and double letters.